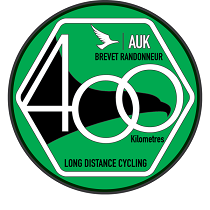 That rare type of event; a four hundred km Audax ride in Wales without AAA points! 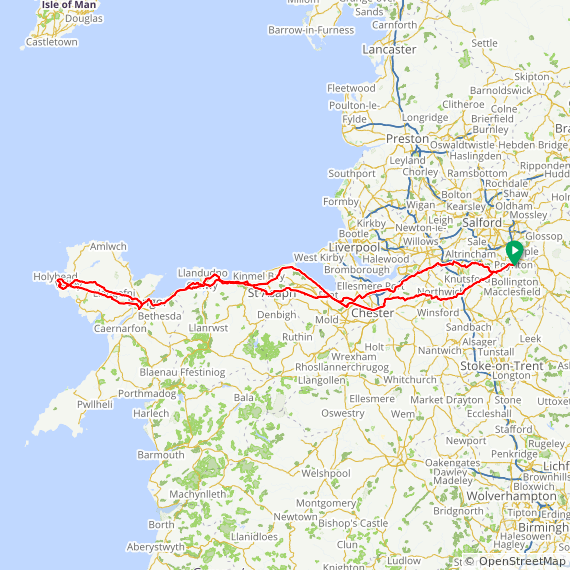 This is a fairly easy ride from Poynton to Holyhead and back. Start/finish: Poynton (south east of Stockport). This 400km version is a ride across Cheshire and along the North Wales coast to Holyhead and back. Only 2 major climbs are encountered, with the first at 83km onto 263m Halkyn Mountain to avoid the mainly dual carriageway through Mostyn, the second, 158m over Sychnant Pass at 142km to avoid the coast road between Conwy and Pemmaenmawr. We use some high quality cyclepaths. The Chester Greenway is traffic-free all the way from Mickle Trafford to Connah's Quay with a good quality surface. Then we use the coastal path from Llandulas to Rhos-on-sea instead of riding through Colwyn Bay with again a surface suitable for making Audax progress, but you will need to watch out for sand and gravel. Unbelievably the steepest climbs of the whole ride are encountered on this cyclepath! Some serious flirting with the A55 takes place but it's now possible to get all the way to Bangor without using the high speed dual carriageway, thanks to the 21st century cyclists bridges and Telford's 19th century road at Pen-y-Clip. Bridges are a particular theme of this ride. You will encounter the Hartford "blue" bridge over the Weaver Navigation, while the Chester Greenway uses a fantastic new cyclists' bridge at Queensferry, as well as the shared railway bridge over the Dee at Hawarden. Special cyclists' facilities are in place near Saint Asaph and either side of the Pen-y-clip tunnels. And of course, you get to cycle over the historical important bridges to Anglesey, first Stevenson's Britannia Bridge then Telford's Menai Bridge. Bringing you right up to date, you will encounter the modern Dee cable-stayed bridge on the way back. There are 24 hour eating opportunities at Abergele, Chester services (M56) and Lymm services (M6) so you are recommended to time your ride to undertake the Abergele-Lymm section overnight, where the navigation is also remarkably easy. On a more poignant note, the route takes you past the scene of the tragic incident where 4 Rhyl CC riders were killed by an out-of-control vehicle on a Sunday club run in 2006. There is a memorial at the site, on the A547 just after the Abergele control (on the right just after the 2nd turning to the right).